Generic Company Place Holder Typing Genius - installs 450 Emoticon(Emoji)! Back in February, it looked like Apple would crack down on apps that allowed iPhone users to unlock emoji—those little emoticons most associated with texting in Japan. Gary Fung, the developer of Typing Genius, said that Apple told him it would remove emoji-unlocking apps from the App Store. 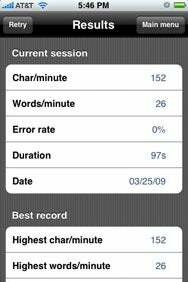 Time Your Typing: As you practice typing on the touchscreen of your iPhone or iPod touch, Typing Genius tracks your performance, comparing it to your best results. Well, it’s now April and Fung’s Typing Genius is still available for download. Perhaps that’s because the app, which does let you use emoji icons for your iPhone or iPod touch if you’re running the iPhone 2.2.1 software update, has another main purpose altogether—it’s a tool for practicing your typing skills on the iPhone’s on-screen keyboard. Typing Genius provides excellent tools to prove your skills and improve your speed. With 17 categories and more than 50 exercises, Typing Genius resembles a true desktop-class typing trainer. Some of the various training modes include left or right hand training; left and right hand training with random or patterned strings of characters, numbers, punctuation, symbols, and full sentences; or something called Word Salad, which is a random selection of words mixed together. Another mode thrown into the mix, called Slang mode, is designed to help you learn how to type in shorthand quickly. However, this feels very hard to get used to since typing on the QWERTY style keyboard with auto-correction enabled lends more naturally to using a more “standard” vocabulary—that was my experience, anyhow. I found typing slang in this mode to be very awkward, and I have used a ton of it on other phones. The use of this typing tutor should increase your typing speed, but even if you have already mastered iPhone typing, Typing Genius can certainly give you bragging rights over other iPhone typists. Typing Genius can be frustrating, particularly if you’ve gotten used to the iPhone’s usual behaviors of capitalizing the first word of a sentence or switching back to the standard keyboard after inputting some punctuation. Typing Genius does neither of those things consistently. Another source of frustration is the fact that you cannot go back to the previous line. I like to go back and correct my mistakes as I type, but if they occur at the very end of a line of text, the program automatically advances to the next line. All in all, Typing Genius does exactly what it claims to do—provide a structured practice typing setting. And, at least as of this writing, the app still lets you use emoji icons. Typing Genius is compatible with any iPhone or iPod touch running the iPhone 2.x software update.